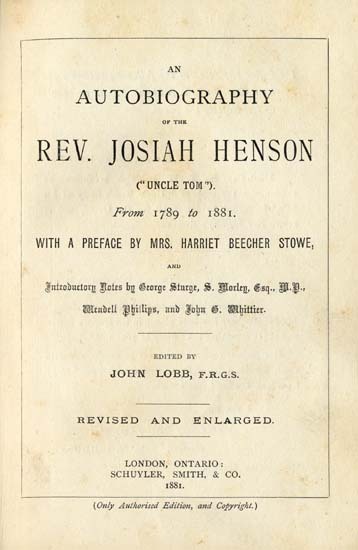 Josiah Henson, 1789-1883, Harriet Beecher Stowe, 1811-1896, preface by, and John Lobb, 1840-1921, edited by. An Autobiography of the Rev. Josiah Henson ("Uncle Tom"). From 1789 to 1881. With a Preface by Mrs. Harriet Beecher Stowe, and Introductory Notes by George Sturge, S. Morley, Esq., M. P., Wendell Phillips, and John G. Whittier. Edited by John Lobb, F.R.G.S. Revised and Enlarged.